Sam Fordyce, Texas, or Samfordyce, Texas. Also spelled as Samfordyce, the town became the western terminus of the Sam Fordyce branch of the St. Louis, Brownsville and Mexico Railroad in 1904. Samuel Fordyce, Sr., was a financier of the SLB&M. He didn�t take a direct role in the development of the town, nor is it known if he ever visited his namesake, which was a shipping point for goods that were bound for Rio Grande City. A post office opened in 1905. The census of 1910 did not list Sam Fordyce as a town, despite the fact that there was a hotel, post office and store. Establishment of the town was thwarted by unclear ownership of properties and a failure to irrigate the land. Hope revived during 1916-1917, when the Army used the site in conjunction with nearby Fort Ringgold, but in a few short years the troops were reassigned and only 75 civilians remained. 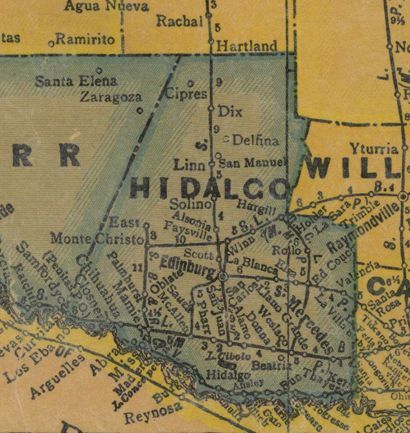 The railroad extended its line to Rio Grande City and Fort Ringgold, dashing any remaining hopes of growth. During the Great Depression through the 1960s, the population was given as 125. It dropped to only 85 during the 1970s and 80s, an the town had all but disappeared by 1990.